Essentially if the DVT is unlikely a d-dimer is performed and if negative the alternative causes for symptoms should be investigated. Remember d-dimer can be elevated in inflammatory states, pregnancy, infections, trauma, DIC, cancer, haemorrhage etc. For this reason the Wells’ score should not be used in pregnancy as it is not validated. There are no scoring systems used in pregnancy. 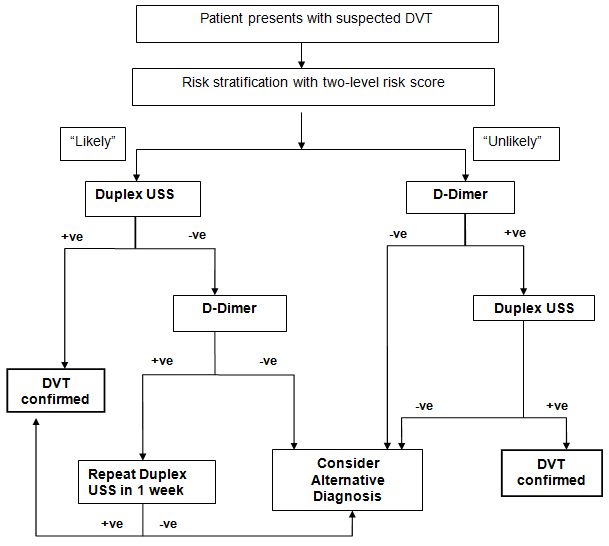 A low score results in a <15% risk of DVT and combined with a negative d-dimer the risk of DVT is approximately 0.5% at three months. If the Wells’ score is high then the patient should receive a doppler ultrasound scan and a d-dimer is not required. In reality most patients will have one of these risk factors. In reality the patient needs to be involved in the decision making. Most patients will have asked for medical attention because of symptoms and to not offer treatment for those symptoms especially in the face of a blood clot in the leg may not be acceptable for many despite there being debate in the medical community. If a proximal-only approach is taken then the examination must be repeated to look for extension. Health economics may also play a part in this. Because of the uncertainties and inevitable patient choice many hospitals will perform full leg ultrasonography. This avoids repeated examinations and will detect isolated distal DVT. In addition treament of distal DVT may become more acceptable with newer anticoagulants due to their ease of use and acceptable side effect profile. There is reference to NICE guidance, ACCP guidance and a ‘how I treat isolated distal DVT’ article below. Remember the ‘superficial’ femoral vein is a deep vein! The final choice often depends on what is funded in your area and also the patient’s renal/liver function, ability to take tablets, co-morbidities, potential side effects, other medications, need for dossette box, availability of reversal agent, bleeding risk etc. Guidance suggest that if a scan cannot take place within four hours then treatment should be initiated prior to confirmatory diagnosis. Treatment generally is carried on for three to six months and then a risk assessment as to whether long term anticoagulation is required. Provoked DVT do not usually require long-term anticoagulation and three months anticoagulation is usually sufficient. For those with unprovoked DVT those that are at higher risk of recurrence are males, proximal over distal VTE, obese patients, anti-phospholipid syndrome, active cancer and positive d-dimer post anticoagulation. The risk of recurrence for an unprovoked DVT is 5-10%/year but higher if risk factors. Therefore long-term anti-coagulation is frequently recommended for unprovoked VTE with risk factors for recurrance. Scoring systems have been developed (e.g. DASH score) but are not validated on a population level. Bleeding risk also plays a part in recommending long term anticoagulation. Newer agents are being investigated in clinical trials and most DOAC are licensed for long-term prevention (apxiaban can be used at reduced doses and rivaroxaban is being investigated at lower doses). Aspirin also has a modest effect in preventing VTE after an initial period of anticoagulation but the bleeding risks and efficacy verses newer anticoagulants must be weighed up. Anti-embolic stockings generally do not help prevent post thrombotic syndrome, but some patients may find them useful for symptom control. This is summarised in the SOX trial (reference below). The investigations involve looking for a cause in the above tabel. Careful history and examination is required. A FBC, U&E, LFTs, bone profile, clotting profile (prior to initiation of anticoagulation), CXR, breast examination (females), PSA (males) is a standard set of investigations. The SOME trial looked at first unprovoked VTE and randomised between standard investigation and standard plus CT abdo pelvis and found no benefit in terms of survival or pick up of malignancy by performing CT scans. Therefore further investigation is only required if suggested by history/examination (e.g. if change in bowel habit may want to do colonoscopy etc.). The trial did include PR/pelvic examination as a ‘basic investigation’. Pelvic examinations are not usually performed in busy medical units and the trial picked up no gynaecological malignancy with a pelvic examination. Our patient would need the result repeated in 12 weeks to confirm. We can perhaps go over the DRVVT test in another case! Currently warfarin is the standard of care for patients with APS and VTE. DOACs are undergoing investigations as alternatives. Our patient had an unprovoked proximal DVT. She was initiated on LMWH and warfarin as she had a positive DRVVT and there was a concern that she may have anti-phospholipid syndrome. She had the DRVVT repeated (whilst on warfarin using a 50:50 mix) and this remained positive. On further questioning she admitted to a facial rash, joint aches and fatigue which she put down to stress. An auto-antibody screen was sent along with a referral to a rheumatologist. This entry was posted in Anticoagulation, Thrombosis and tagged anticoagulation, coagulation, d-dimer, DVT, Swollen leg, ultrasound, VTE, wells score. Bookmark the permalink.